The reason that Progress chose to enter the BPM market is clear. Businesses are increasingly turning to BPM to implement and improve their business processes. Why? Firstly because no other solution can help enterprises achieve real-time visibility, agility, efficiency and business empowerment the way BPM does. Secondly BPM enables this to be achieved with low Total Cost of Ownership (TCO) and ease of use. Savvion is a trailblazer and industry leader – Savvion is a pioneer in BPM but is also still at the cutting edge. We wanted the best BPM thinkers at Progress. Savvion has been proven to work at the enterprise level. Some BPM systems only work at the departmental level, but Savvion works at either departmental level or enterprise levels. Savvion offers System-centric and Human-centric BPM – Savvion can orchestrate processes but can also involve human users in workflow. Savvion is event-enabled – so business processes can respond to events. Progress has a lot of momentum behind event-driven business systems through our Actional and Apama solutions – and Savvion will work seamlessly in event-driven business solutions. Savvion offers vertical industry solutions – Analogous to Progress’ Solution Accelerators, Savvion offers out-of-the-box vertical solutions in industries including Financial Services and Telecommunications. Savvion offers an integrated Business Rules Management System – Expressing logic in terms of rules can often be very important. Savvion have developed a rules engine, integrated with their BPM system, enabling decision-oriented BPM – modifying the process flow based on rule conditions. This is a powerful capability. Savvion offers an integrated Analytics Engine – Business Intelligence has proved its worth but it is a “rear view mirror” technology – analyzing facts that have already happened. Savvion’s analytics engine enables continuous analytics to augment business processes and human user with advanced real-time analytics, enabling better decision-making. Savvion offers an integrated Document Management System (DMS) – Savvion’s integrated DMS enables rich document handling and empowers document-centric BPM. Savvion BPM suite is highly scalable, high performance and highly available – At Progress we pride ourselves on the strength of our underlying technology. We want to offer our customers a complete solution that embodies scalability, performance and availability. Thus selecting a BPM vendor in-keeping with this philosophy was key – and Savvion is just such a vendor. Savvion is a great cultural fit with Progress – An often-overlooked point is that cultural fit is key to acquisition and integration success. The Savvion team pride themselves on being innovative, customer-focused and fun - just like the Progress team. We’re looking forward to working together. I was proud to recently be appointed CTO and head Corporate Development here at Progress Software http://web.progress.com/en/inthenews/progress-software-ap-12102009.html. But I don’t want anyone to take that as an indication that I won’t still be involved with event processing – au contrair. Event processing (whether you call it CEP or BEP) is now a critical part of enterprise software systems – I couldn’t avoid it if I tried!! It’s incredibly rare to have the pioneer in a space also be the leader when the space matures. I’m really proud that Progress Apama achieved that. Our former CEO Joe Alsop has a saying that “you don’t want to be a pioneer; they’re the ones with the arrows in their backs!” Usually he’s right on that one – but in the case of Progress Apama, the first is still the best! Independent analysts, including Forrester and IDC, all agree on it. Our customers agree on it too. It’s tough at the top! I had no idea that when you are the leader in a space, many other firms’ technology and marketing strategies are based completely around you. I have met ex-employees of major software companies that have told me that there are Apama screenshots posted on the walls of their ex firms’ development centers – the goal being to try to replicate them or even improve on them. Other firms’ marketing has often been based on trying to criticize Apama and say why they are better – so their company name gets picked up by search engines when people search for Apama. Event processing has matured and evolved. Yes it is certainly used to power the world’s trading systems. But it’s also used to intelligently track and respond to millions of moving objects, like trucks, ships, planes, packages and people. It’s used to detect fraud in casinos and insider trading. It’s used to detect revenue leakage in telecommunications and continually respond to opportunities and threats in supply chain, logistics, power generation and manufacturing. It enables firms to optimize their businesses for what’s happening now and is about to happen – instead of running solely in the rear view mirror. Despite all the new application areas, Capital Markets remains a very important area for event processing. Critical trading operations in London, New York and around the world are architected on event processing platforms. The world’s economy is continually becoming more real-time, needs to support rapid change and now needs to support the real-time views of risk and compliance. We recognize the importance of Capital Market. My congratulations to Richard Bentley who takes on the mantle of General Manager of Capital Markets to carry on Progress Apama’s industry-leading work in this space. With his deep knowledge and experience with both Apama and Capital Markets, Richard is uniquely placed to carry on the solutions-oriented focus that has been the foundation to Progress Apama’s success. Even in a terrible economy, the value of event processing has been proven – to manage costs, prevent revenue leakage and increase revenue. Progress announced our fourth quarter results today http://web.progress.com/en/inthenews/progress-software-an-12222009.html which saw a double digit increase for Apama and triple digit for Actional. Apama and Actional are used, increasingly together, to gain visibility of business processes without modifying applications, to turn business process activity into events and to respond to opportunities and threats represented by event patterns – enabling the dynamic optimization of business performance. But one thing I do believe: that soon there will be no such thing as a pure-play CEP vendor. CEP is part of something bigger. We’ve achieved the first mission, which is to raise the profile of event processing as a new technique that can solve hitherto unsolvable problems. Now the follow on mission is to ensure event processing finds its way into every solution and business empowerment platform. It is one of a set of key technologies that together will change the world. 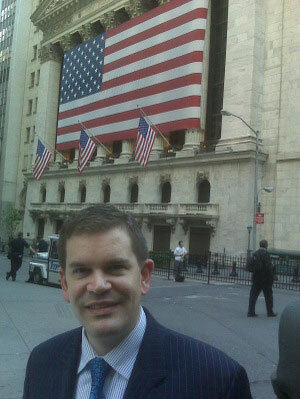 I wish everyone Happy Holidays and a successful and profitable 2010 !!! In an interesting demonstration of real-time monitoring, Apama participated in a recent study that was conducted by Radboud University as part of the Dutch "Four Days March". The march is an annual event in which tens of thousands of participants walk daily distances of 30-50 KMs for four days in succession. Unfortunately, past marches have had some unfortunate instances where participants have been overcome by heat - including a couple of deaths. In a pilot study this year, volunteers took a pill embedded with an RFID chip and thermometer, which sent signals every 10 seconds to a Bluetooth-enabled GPS phone. The phone in turn sent the information to an implementation of Apama, which correlated the information about the volunteer, their temperature and their location, all plotted on an implementation of Google Maps. Leveraging the capabilities of Apama, monitors could track the progress of volunteers and identify those volunteers whose temperatures exceeded certain thresholds. And with the ability to correlate that information with the GPS data, they could tell where those volunteers were on the route, thus delivering a CEP-driven infrastructure for real-time monitoring and, if needed, a pre-emptive reaction to help somebody who might shortly be in distress. In the image below, one can see the purple "pins", illustrating where on the route the volunteers are. Hello from Hong Kong. As always it is fascinating to see how CEP is evolving in Asia. One trend I am observing is the huge interest in Hong Kong in rogue traders and white collar crime – and how CEP can be used to detect and prevent this – before it moves the market. Obviously the original rogue trader, Nick Leeson, is well known here. But there has been a great deal of interest in more recent goings-on, at firms such as SocGen. Amazingly, until a couple of years ago, insider trading was not illegal in Hong Kong! Now we have a highly volatile market, with a lot of uncertainty, huge event volumes and a real problem of seeking out and preventing rogue trading activities, as well as managing risk exposure proactively. Of course CEP provides a compelling approach. In market surveillance - the ability to monitor-analyze and act on complex patterns that indicate potential market abuse or potential dangerous risk exposure can allow a regulator, trading venue or bank to act instantly. Banks want the reassurance that they are policing their own systems. Regulators need to protect the public. The media and public here find this fascinating. On the topic of a different kind of white collar crime – consider using CEP to detect abuse in the gaming industry. The gambling phenomenon that has propelled Macau to overtake Las Vegas as the world’s biggest gambling hub is also an exciting opportunity for CEP. We have customers using CEP to monitor and detect various forms of potential abuse in casinos. Events that are analyzed to find these patterns include gamblers and dealers signing on at tables, wins and losses, cards being dealt etc. It is possible to detect a range of potential illegal activities, ranging from dealer-gambler collusion to card counting. As a final thought - having met with some of our customers that operate both in Hong Kong and mainland China, it is clear that China is a massive market opportunity for CEP. Exciting times ahead for CEP in Asia. I’m sitting here at Melbourne Airport in Australia on my way to Hong Kong. I’ve been delayed by a typhoon – probably a good reason to delay. After a very successful week in Sydney and Melbourne visiting customers, I thought I’d report that the CEP market is hotting up down under! As you would expect financial services is an early adopter and Apama has had several customers in Australia in this space for a few years now. But the demand is increasing. This is driven by factors such as increasing competitive pressures in the trading space and the impending fragmentation of the Australian market. Just like in Europe and North America, it is likely that several new trading venues will join the Australian Stock Exchange in offering liquidity in Australia. My diagram shows some of these in the form of Chi-X, AXE and Liquidnet. 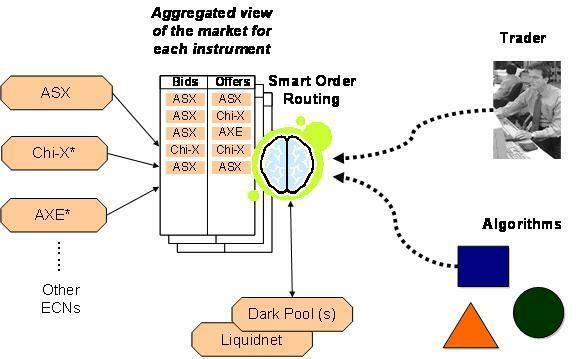 Complex Event Processing offers a powerful way of monitoring, aggregating and analyzing the liquidity across all of these markets, as well as making real-time routing decisions. This of course can work in parallel with traders and algorithms. In fact it is becoming very interesting to see trading decision algorithms routing messages to execution algorithms, routing messages to liquidity tracking algorithms, routing trades to the market, which are being checked by market surveillance algorithms -- and all part being implemented in CEP. I am biased of course, but what other technology can offer the seamless federation of such systems. Events provide a powerful and low latency mechanism for such interoperation. Each component can be built independent of the other - but yet they can work together seamlessly. But I am getting off topic! Over the last few years Australia has mainly been interested in equities algorithms, but now the interest in FX, futures, bonds and commodities is growing. While I was in Sydney, I was pleased to deliver the keynote address at the Trading Technology conference and met many interesting sellside and buyside participants with a variety of trading interests. It was fascinating to see how the market is developing. And it is not just financial services where CEP is being applied down under. I also met with organizations in a number of other spaces including travel, transportation and location-based services. I hope to report more on these in the near future. And now I look forward to finding out what is happening in Hong Kong and Asia beyond. Hopefully I can avoid the typhoon!